Energy Balance Germany 2003 in million t.c.e. In 2003 Germany's energy supply was dominated by energy imports (413 million tonnes of coal equivalent or t.c.e. in short), primarily by mineral oil (215 million t.c.e.) and natural gas (119 million t.c.e. ), as well as by imported uran for nuclear power. Lignite and hard coal - the largest worldwide source of carbon dioxide emissions when burning - were the only significant indigenous sources (128 million t.c.e.) used in Germany. Energy conversion of the mineral oil into fuel products, lubricating oils, bitumen and chemical feedstocks took place in refineries operated by oil companies while power plants, operated by utilities, converted coal, nuclear power and parts of the natural gas into electricity. Other conversion methods took place in cokeries, briquet factories and District heating plants. Most of the electricity production in Germany is based on huge grid-connected power plants, linked together with 1,67 million kilometres, of high voltage lines and 566,300 transformers, altough Germany's surface area is only around 357,000 sq.km.! Renewable energy sources (first biomass, than wind, than hydro only little photovoltaic) are more increasingly used, but - to be honest - they won't make a big contribution to the overall efficiency: by Federal German law they need to be fed into the high voltage electricity grid. Here they are forced to pass to the point of final usage, producing the same transmission losses as the electricity, which is made from fossil fuels or nuclear power plants. Some of the mineral oil, gas and electricity were also sold for foreign bunkers or used for non-energetic consumption (not used for energy generation but for products, mostly synthetics and chemicals). After the conversion process with all its flaring and transmission losses and less the export and non-energetic consumption, only 316,8 million t.c.e. of energy are at the consumers final disposal - 58 percent of the 546,8 million t.c.e. of energy we started with. Here householdes contributed the most part of the total energy demand in the country (93 million t.c.e. ), followed by the transport Sector (88,7 million t.c.e. ), industry, trade, commercial and other services. 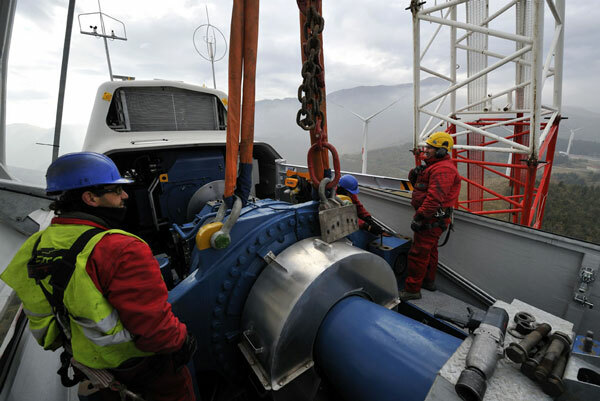 Installation of a wind power plant. At the top left end of the nacelle, the air intake for the air conditioner can be seen. In worst cases, these units may need up to 15% of the total electricity, produced by the actual wind power. This energy does not even reach the ground, though. Similar figures apply to the mechanical losses inside the gearbox (...on the hooks).